Wow, it’s hard to believe that another season has come and gone, and I am once again waiting with anticipation for a season comparable to the past two. Although I’m an eternal optimist, it will be difficult to compare to 07/08 early deep powder, the stable snow pack on the coast range, and great timing of sun, snow, friends, and photographers. The season kicked off with a bunch of deep days, shredding with friends on Whistler/Blackcomb. It was the typical early season training; skiing top to bottom runs and feeling the legs burn. Christmas was especially special this year as I joined many long time friends from around BC to celebrate the long awaited opening of Revelstoke’s ski hill. 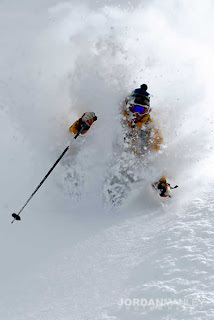 We were blessed with Revi’s reputable Champaign powder, and seemingly endless untracked lines. Returning to the coast I fired up my snowmobile and headed north to the small mining town of Bralorne; where I had arranged a lodge for the week of New Years. Twelve of us spent five days sledding up mountain peaks, and shredding down on skis and No-Boards. Dave and I continued deeper in to the heart of the Kootenays to the renowned hippie commune known as Nelson. Upon arrival, we hooked up with local photographer Bryan Ralph who guided us around Whitewater ski hill. With no new snow in the Whitewater’s forecast, Dave and I headed to our old ‘stomping grounds’ of Fernie, where we met up with long time local and renowned photog. Henrie Georgie. Henrie pulled some strings and arranged some early mornings of shooting on the hill. Through out the year my photos were published in Freeskier magazine, Skier magazine, the cover of Skier magazine, and Whistler/Blackcomb magazine. In addition to published photos, I also had two published articles in Skier magazine. I competed in the Red Bull Cold Rush, which was edited and broadcasted on Rip TV. I'm looking forward to skiing and shooting many more fun lines in the area, and around B.C.